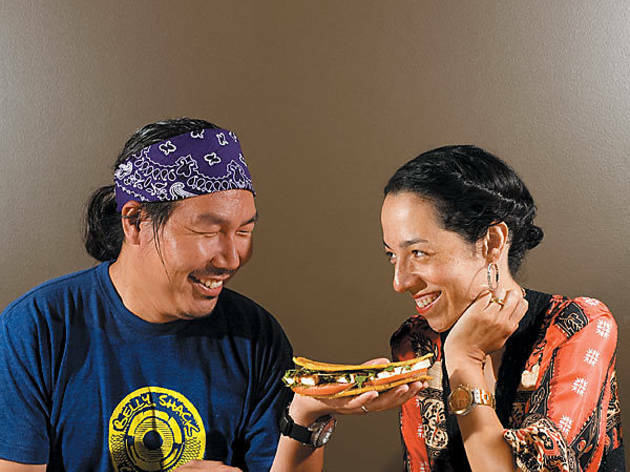 The couple behind Urban Belly, Bill Kim and Yvonne Cadiz-Kim, have plenty to say about combining their cultures for their new project. Yvonne Cadiz-Kim Belly Shack will be an unexpected neighborhood eatery. It’s Asian-Latino at its finest, something that I’ve seen on the East Coast when I lived there but haven’t really seen in Chicago. 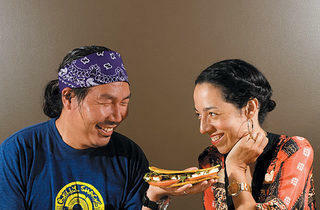 Bill Kim I’m the chef, but Yvonne is really the creative force behind it—she and her sister Yasmina. YCK I’m Puerto Rican, so I supply a lot of the animation, the fire. He’s very Zen, Korean, you know, but I’m very Latin in my ways so it’s always an interesting combination when we collaborate. BK Well, I think in the beginning it was kind of a struggle for me to let the control go, but I trust her. I try to do everything possible and she ropes me in. Even with the menu—which, by the way, is more than just sandwiches, with small plates and specials, soups and soft-serve—I thought about doing all kinds of stuff, and she reined me in. We also found out recently that she has celiac disease [a digestive disorder in which gluten causes a toxic reaction]. YCK Which is tragic because, at Urban Belly, all I want to have is dumplings and noodles. BK She’s taken me to Puerto Rican places for the jibaritos (pictured), so I’m doing something with that, with the plantains but with marinated and grilled tofu, lettuce, tomato and a really flavorful sauce. YCK At the same time, when a Puerto Rican comes into this restaurant, [we want] to give them something somewhat authentic, [so] we’re doing Lola’s lechon—Lola’s my mother—marinated roast pork on Wednesdays. BK Right, but I’m always approaching stuff and adding an Asian accent, so I’ll use plantain but with taro and maybe dried shrimp instead of chicharrones. Or a South American sausage stew but with rice cake and braised pork. So I have a vision for the food, while Yvonne and Yasmina take that vision along with their own style for the design. What are we calling it? YCK Bringing the outside in, but in an urban way—sewer covers, streetlights…the logo is a play on the old subway token because we’re under an El station. We were just in L.A., and we were all really inspired by street graffiti, so my sister and I are doing our take on that. It makes sense because I’ll tell you, Bill is an undercover homeboy, met a Latina and now he has some street cred [Laughs]. BK I do, it’s true, I’m an undercover brother. YCK Who knew that a Korean guy listens to hard-core rap? YCK He turned me on to noodles, and I turned him on to salsa. We’re still working on the dancing, though.